This is my honest review of The Cut Buddy self line up tool. If you decide that this tool is something that can you can use, you may order it here on amazon, or at the official Cut Buddy website. Apply the coupon code 3WP to receive an instant discount when bought here on The Cut Buddy website. You can watch my video review embedded below for a full physical video demonstration on how to use the product. What is it The Cut Buddy? For those of you who do not know, The Cut Buddy is a mens grooming tool that helps in the shaving process by serving as a guide for keeping straight and or perfectly curved linings. I t works to help you keep the front line straight via the straight side of the tool. Please consult the video below for a visual example. For the guys who like nicely curved sideburns, and the guys growing out their beard, The Cut Buddy helps to keep the lining of those styles nice. It will even help with the back lining as demonstrated in the video review. Who is The Cut Buddy For? I recommend The Cut Buddy, but it isn’t for everyone. If you are a barber or a person who is very experienced with giving line-ups to yourself and other people, then I feel that you will not benefit from The Cut Buddy as much as a person who does not have the same skill level and experience as you when it comes to lining and cutting hair. Despite that, you may still enjoy the tool even if you are very skilled at cutting hair. It is something you have to try to decide. The Cut Buddy is perfect for people who are not very good at lining and or have never done hair lining before. Most people don’t do their own line ups because they are scared to try due to the fear of pushing their hair-line back. This tool is perfect for those type of people because it eliminates that fear factor by blocking the hair and only allowing the user to cut in the shape of the side of the tool that is choosen. Either straight angles or perfectly curved “C’ shaped angles. If you would like to get your hands on The Cut Buddy, you can pick one up here on Amazon for full price, or you can buy it at the official Cut Buddy website here for a discounted price when you apply my coupon code 3WP. Where can you get one if they are sold out? If you would like to buy a cut buddy and they are currently sold out, please sign up for email updates on my site and I will send you an email letting you know when they are back in stock and ready ship immediately. 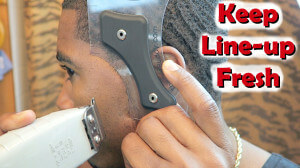 Here is the video review so you can get a better understanding of how The Cut Buddy is used. ‹ Spotlight on 360 Wavers in the Wave Game!